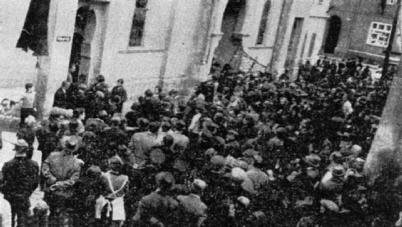 In November 1938, after the pogrom called „Kristallnacht“ Jews were under pressure to sign a voluntary declaration of moving away and many of them had to leave Žatec. This „success“ of the violent expulsion of the Jews was reflected in the census May 17, 1939 over the years. Lived in Saaz still 924 Jews, in May 1939 they were only 91 (racial Jews) and throughout the Sudetenland only 2400. No other region of the Reich was not in such a short time „cleansed of Jews“, as the Sudeten districts. It was almost „Judenrein“ and Jews in it were completely lawless as outlaws in the Middle Ages. When we come to the central question of responsibility for these events, so we have to conclude that the preparation and implementation of these actions and deportations would not be possible without a lot of accomplices in all parts of the population. And all this is not possible to blame to the officials, units of the Gestapo, the SS and the National Socialists of the Reich. Implementation of these crimes would never have been possible if as well as everywhere else in the territory controlled by Germany the local minions wouldn´t cooperate. The truth is also the introduction of compulsory wearing of Jewish yellow stars and the November pogroms were for the parts of the population of the Sudetenland more than annoying. They also found that they did not receive any new freedom. It was whispered among the people saying ‚We wanted to right and right comes to us „(Wir wollten unser Recht und Recht geschieht uns). The Munich agreement determined the fate of the Jews in Saaz and in the Sudetenland. With the German army (Wehrmacht) came to the border unit SD (Secret Defence Police) and SS. They have already lists compiled by members of the SDP, Jews, Social Democrats and Communists, on the basis of these people were arrested in large numbers. Most, however, remained in the gray zone and indifferent. Overall the behavior to the Jewish citizens was not only the enemy, but to be criminal in nature. Indistinguishable from the behavior of citizens in the empire. Saaz here was no exception. The vast majority, however, stuck in the gray zone of enormous human indifference. The fate of the Jews, however, as the puzzle has loomed future fate of the Sudeten Germans. After the end of the Third Reich the circle is closed. At the beginning of the short history of the Imperial County (Reichsgau) Sudetenland in the fall 1938 was the escape and expulsion of Jews and Czechs. 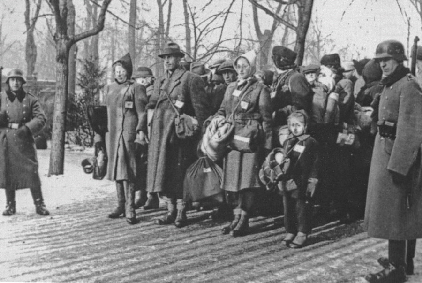 In 1945 it ended in the expulsion of Sudeten Germans from their homeland.